The best sci-fi film in years. Alex Garland’s Annihilation is what you’d get if you let Terrence Malick make something like Alien: Covenant, but he wasn’t allowed any xenomorphs. Or maybe you could consider it the perfect cross-section between Arrival and Interstellar, heavy on the otherworldly sci-fi while also diving deeply into the cerebral, ineffable cosmos. Either way, Annihilation is thrilling and insane and frightening, like staring straight into a giant sentient kaleidoscope powered by the sun. No spoilers ahead for Annihilation. Coming to theaters this Friday, Annihilation’s premise might make a casual viewer think it’s an Alien Covenant knockoff. You’ve got militarized scientists exploring a strange landscape with hints of alien infection and mutated monsters. But Covenant feels like a lazy caricature by comparison, like someone actually watched Annihilation first and tried to emulate its success. Plus, Annihilation was adapted from the Nebula Award-winning book of the same name, written by Jeff VanderMeer, and is actually part of a three book series, The Southern Reach Trilogy. In the book, the characters are introduced without names. But in the film, Natalie Portman stars as Lena, a biology professor with a military background who joins a mission to investigate a supernatural phenomenon triggered by a meteor that crash-landed through a lighthouse in northern Florida. The public doesn’t know about the mysterious “Shimmer” gradually expanding outward from the impact site. Everyone who went inside — including Lena’s husband — has disappeared. So she joins a small team of scientists to investigate what happened. The results are absolutely horrifying and totally brilliant. 'Annihilation' sends five women on a perilous mission into the heart of a supernatural phenomenon. Though Garland adapted the story from VanderMeer’s novel, fans of the book will probably be just as bewildered as the rest of us when they step out of the theater. Garland is best-known for his work on Ex Machina, an anxiety-laden exercise in titillation via self-aware robotic A.I. construct, but here he borrows a bit more heavily in the horror cred he earned with 28 Days Later. Some scenes in Annihilation leave you queasy. Annihilation offers a deeply mysterious and thrilling viewing experience in which dread and anxiety permeate through most scenes. Inside the Shimmer, something mutates organisms at the cellular level, leading to all sorts of beautiful creations in nature, but also some truly horrifying creatures. Each act in Annihilation is carefully crafted, with narrative threads evolving along with its very premise: Everything gets distorted inside the Shimmer, which is part of the problem. We’re just as disoriented as this team that encounters increasingly more bizarre things the deeper they get, like these creepy flower people. Kind of beautiful but also deeply disturbing. This image sums up 'Annihilation' in a nutshell. Annihilation tugs you in different directions constantly. Just when you think you finally have some things figured out, you realize you were only half-right, and what you missed is about to blindside you. And while we see this expedition unfold, we’re also treated to flashbacks from Lena’s life some time previously, exploring the nature of her relationship with her husband (Oscar Isaac). Isaac and Portman’s chemistry as a married couple feels grounded in a kind of reality you don’t get often in these types of stories. There’s real love there, but it’s also complicated. They’re both soldiers and met in the military, and each brings that trauma into the relationship. One of the greatest selling points of this movie all around are the performances. Portman does a sublime job as the soldier-scientist archetype, the curious sort of person looking for answers who’s also totally capable of gunning down a giant mutated croc as needed. But she’s also deeply damaged, hurt, and looking for meaning. She thinks she can find it by throwing herself into what everyone considers a suicide mission. That mutated gator has some weird teeth. Gina Rodriguez is absolutely possessed, flexing more mature acting muscles than we see from her in Jane the Virgin. She plays the group’s medic, grounded in years of practical experience, who brings a different perspective than the scientists she’s with. The always amazing Tessa Thompson plays a brilliant, weird physicist who offers a sharp intellect but a believable amount of strangeness. Rounding out the team are Tuva Novotny as an anthropologist and Jennifer Jason Leigh as a psychologist and squad leader. It’s refreshing to see a movie focused entirely on females thrive in such a way. Lena's combat experience makes her invaluable on this mission. 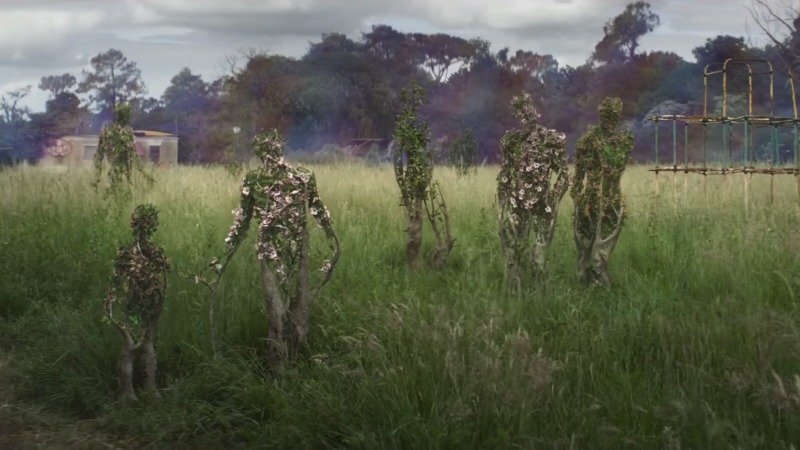 By the end of Annihilation, it’s hard to make sense of what’s real and what’s not. The nature of the Shimmer throws everything into question from the very beginning. The bewildering finale will leave you transfixed, wanting more not only from this universe but from our science fiction. Why can’t all movies be this dazzling, compelling, and totally riveting? Annihilation releases in theaters February 23.